When you see wild animals that are from a tameable family. When you see another hunter's pet. You don't even have to be a hunter. Now you don't have to wonder what's dispelling your buffs. StableHand is a revision of StableHelper 2.2. It's updated to BfA, with all the new changes to pet specs (which sadly meant removing pet respec information). There is also a secondary functionality, disabled by default. Most pets have a base autoattack speed of 2, adjusted by the hunter's haste. But some pets have a much lower or much higher autoattack speed. This is mostly psychological ("haha, my pet's critting big with white damage!" or "oh ****! this spider won't stop attacking me make it stop make it stop") But your pet can have their autoattack capped at 0.25, meaning you'd lose autoattack damage if it were faster than that. There are currently localizations for German and Spanish, but I don't know how good/bad the translations are. 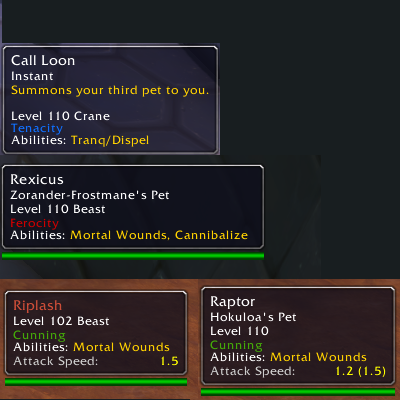 For other localizations, you will only see the tooltip information for your call pet spells, and at the stablemaster. And they'll be in English. Sorry, working on them. Feel free to contribute translations. i got a weird error with stablehand , on my night elf hunter it works flawless and i love it , however on my void elf hunter, same mods same setup stablehand crashes. Caveat patcher, but so far seems to be working for me. Fox peticonmap need change 45822 to 458223 . Known issue: displays family information for Animal Companion, even though that pet doesn't have it's spec or family abilities activated.